It is summer in Hernando County and the temperatures are hot. With that said, the National Highway Traffic Safety Administration urges all parents and caregivers to remember that hot weather could mean serious risks for infants and young children who are left inside vehicles. The NHTSA is reminding everyone to “Look Before You Lock” to ensure that a baby or young child is not left inside of a car, even if it is only for a few minutes. Unfortunately, death or permanent brain damage can happen very quickly when children are left inside scorching vehicles. Caregivers, including day care centers, summer camps and school bus drivers can be held legally responsible when a child is left inside of a vehicle and suffers injury. An experienced Hernando County Injury Lawyer at Whittel & Melton can help victims and families after an unfortunate injury occurs. According to NHTSA data, at least 44 children were killed in 2013 after being left inside of hot cars. This is a higher number of fatalities than average, which indicates a disturbing trend. An average of 38 children have died each year since 1998 after being left unattended in hot cars. In most cases, children are accidentally left inside warm vehicles. 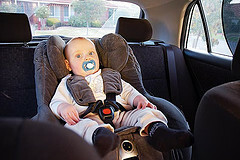 A parent or caregiver may forget that a child or infant is in the backseat. A bus driver may fail to pay attention to a child left on the back of the bus after dropping other children off. In other cases, parents or caregivers intentionally leave children inside a car because they feel no harm will come if they are only left alone for a short period of time. However, the reality is that it does not take that long for a child to suffer permanent injuries after being left inside a hot car. Even when temperatures are in the low 80’s, it takes just 10 minutes for the temperature inside of a vehicle to reach a deadly level. This is still true in circumstances where the window of the car has been rolled down two or more inches to allow air to come in. Young children are at a higher risk for suffering injuries when left alone in hot cars because their bodies are not as well-equipped as adults when it comes to regulating heat. Children can get overheated more quickly than adults. In fact, when compared to adults, children’s bodies can get hot three to five times faster. Kids under the age of four are at the greatest risk of getting sick or dying due to heat-related illnesses – they can die once their bodies reach 107 degrees. Children should never be left alone inside of vehicle at any time. Parents and caregivers should always make sure to look both in the front and back of their vehicle before locking up so that no child is mistakenly left inside a car. If your child has been injured after being left inside a hot vehicle by a negligent caregiver, please call a Hernando County Injury Attorney at Whittel & Melton today at 352-666-2121 to learn how we may be able to help you pursue an injury claim. You can also request a free case evaluation by contacting us online.